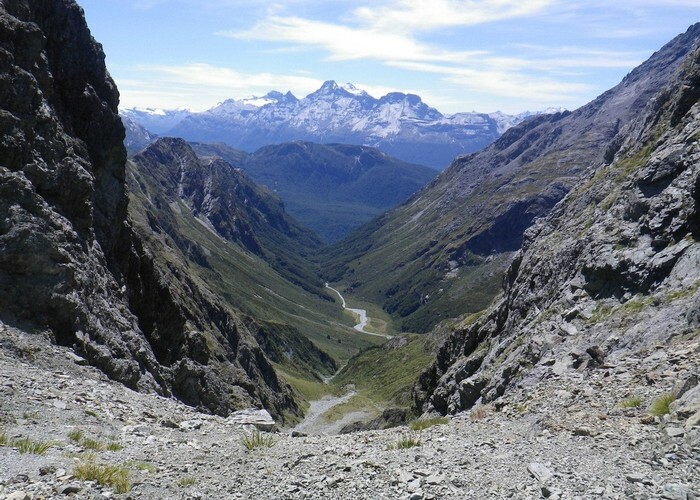 A six-passes trip through the Humboldt Mountains from Glenorchy to the Milford Road. Six untracked rocky passes. Seven little-visited catchments. The dying remnants of glaciation in the range. Double Barrel from pass with the Fraser • By madpom. Licence: cc by. For the second week running we make a tired, hurried departure from work for destinations west and upwards. Thankfully the one hour traffic-jams through Queenstown are absent today, and we make reasonable time - soon finding ourselves cruising easily towards Glenorchy, lake passing by, high peaks coming ever closer. 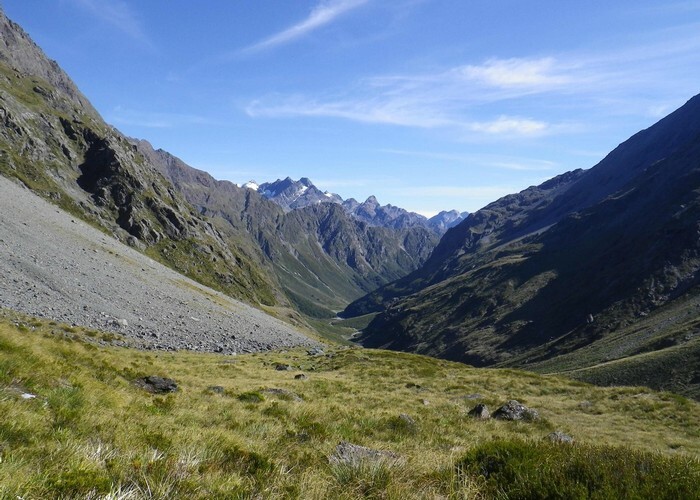 The Scott Creek track is signposted: 2 km beyond the end of the tar seal up the Routeburn Road. A sign, a stile, no carpark. The walk starts easily - I stroll across scrubby farmland on the south side of Scott Creek under a cloudless sky. Rivulets of sweat already trickle between pack and back. Hot. Humid. A couple of poles half-heartedly indicate the route up the terraces south of Scott Creek before giving up and leaving us to follow sheep trails. Reaching the rear of the flats, the route climbs the steep spur south of Scott Creek. We gain some two hundred vertical meters, the vast river flats of the Dart River dropping quickly away behind us - its watercourses scribblings of twisted serpents amid vast white-stone flats. A single orange topped wooden post marks nothing useful, but 80m beyond it a vague ground trail cuts right off the spur across an old slip - regenerating scrub - sidling to the bush edge beyond. Dark, shaded, mossy beech - not a hint of a wind to dry sweat-sheened-skin. The track, a rough unmarked route on my last visit - now well-marked, well-cut, well-trodden; climbs steeply, steadily, sidling above the creek as it ascends. The tight river gorge opens to flats of tall dry grass, unmoving, silent in sticky heat. Tempting flat camp spots beside the cool stream but we push on, climb again at the head of the flats. The track, now in the creek bed, scrambles up small rocky falls, climbing towards Scott Basin. Later sidles tall beach faces beneath high mossy cliffs on the southern valleyside. Emerges into dim dusk-tinted light in the lower Scott Basin. The map shows the flats covered in thick scrub, but we find them open and grassy, scrub restricted to the faces above. We find a lovely flat spot north of the creek to camp, soak long in pools of cool fresh water watching peaks turn from orange to grey as evening fades to night. I wake early, pack tent, climb the creek south towards the Kay saddle. A good ground trail has appeared since my last visit, marked occasionally with cairns - climbing easily beside the creek. Tarns balance improbably on small flats above the valley floor. Dart Valley from Kay Saddle • By madpom. Licence: cc by. Reaching the saddle, Kay Creek opens out beyond. Gentle tussock basin dropping to the broad scrub-bush valley below via unseen falls. A fault line cuts a ruled line north-south across the landscape, passing through Scott Basin, though the saddle, a stark gash across the faces of Mt Bonpland - headed for Sleepy Hollow away to the south. Patches of red ultramafic rock dot its path. We swing west, still climbing towards the saddle with Death Valley. A large tarn lies below the saddle, scree faces climbing beyond the summit. I cut south of the tarn, ascend more stable grassy slopes to peer down into the barren rocky basin of Death Valley beyond. Loose rock scree makes for a slow descent to reach tarns and flats below. From there we sidle grassy slopes on the northern face, avoiding the descent to the forks, cutting into the northern branch of the valley. A tall moraine wall blocks the north fork - I climb onto it - angular rocks loosely bedded in soft-shifting sand. Find beyond, not a glacier, but a thin ribbon of white ice amid crumbling moraine faces. We scramble down, perhaps 30m, into the basin that once held the Death Valley glacier - the ice is now barely 10 meters wide, maybe 4 meters thick. We walk up the glacial remains anyway - easier than the loose, mobile rock beside it. Halfway up meltwater has carved a large cave beneath the ice. I contemplate scuttling across the resulting ice bridge above the void, opt instead cut east onto loose moraine faces to bypass it. Death Valley glacier (rems.) • By madpom. Licence: cc by. A final steep scree scramble takes me to the pass, to look down on to the green basin of Double Barrel Creek beyond. More steep loose scree leads down into its head. The creek cuts deep into rock, descending to the valley below via a series of gorged falls. We bypass them on terraces to the west finding easy, gentle scree slopes leading down to the valley floor. Once there, Double Barrel is as scrubby as the map shows - would be slow going if it weren't for the fact that the creek runs dry. Instead of bashing through thick scrubby flats we walk easily down the dry white stone river bed. Double Barrel Creek • By madpom. Licence: cc by. The valley draining the Double Barrel - Fraser pass lies hidden behind peaks until you reach the forks below it, making it impossible to assess whether the undocumented crossing will be possible or not. The plan is to follow Double Barrel Creek down to the forks, climb back up the side-creek to the pass. However, grassy terraces between the main valley and the pass tempt me - the map hinting at an easy sidle from these terraces to the pass. I succumb to temptation, climb the western valleyside 1km above of the forks, passing above a waterfall and onto the more accessible lower terrace. From there, seek out a route through bluffs to the broader flat terrace above - which proves tricky, exposed. We spend too much time scrambling steep snowgrass - cutting between, above tall bluffs. Find ourselves finally on flat ground 100 m above our destination; find that the terraces do not connect to the pass anyway; find that we must descend into the basin draining pass after all. Next time: follow the creek up from the forks - a straightforward, safe route. We drop into the rocky basin, look SW up the broad scree chute to the southern pass. A long, steep, loose climb but entirely achievable. 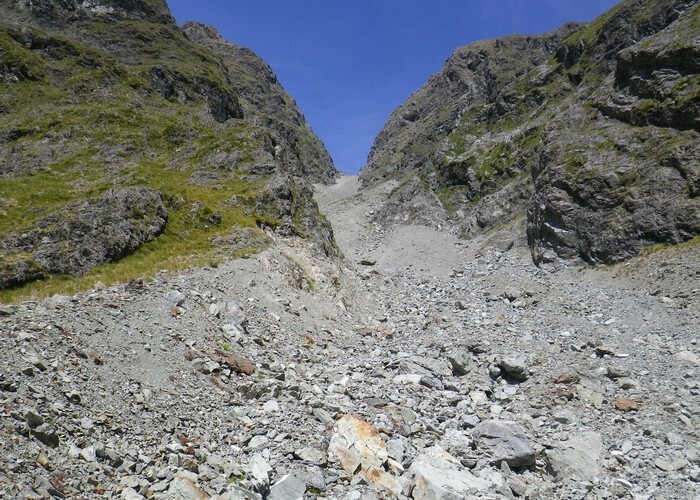 The last 50m prove the hardest: loose, mobile rocky scree - surrounded by hardpack offering little to no purchase. The ice axe proves invaluable yet again: an anchor on the steep backsliding climb. Double-Barrel - Fraser Pass • By madpom. Licence: cc by. 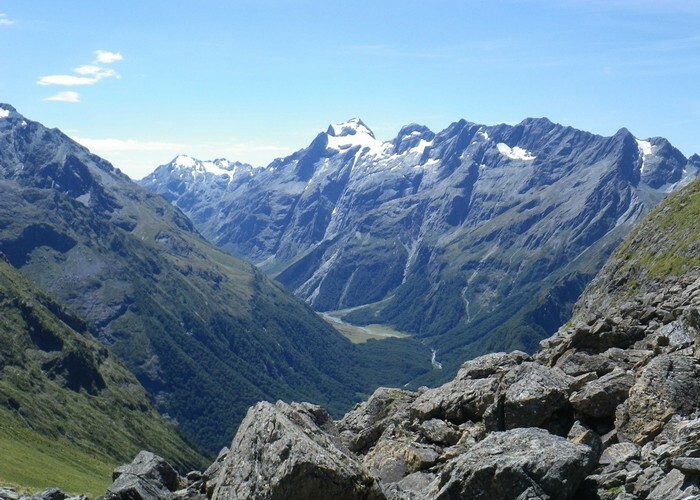 From the summit the view back down the Western branch of Double Barrel Creek is impressive: its grey rock chute leading steeply down broad grassy flats at the forks; green beech forest beyond, dropping in falls to the Routeburn Flats and the road end. Ahead of us two parallel basins descend steeply into the Fraser, separated by a tall grey wall of lateral moraine. The western of the two basins contains the dying remains of a glacier: patches of white ice swamped beneath grey moraine tumbled from the unstable now-ice-free faces above. Five chamois sense our presence: dart out of the basin, heading for the valley below. Another three stand atop the moraine wall: watch them depart, puzzled. I sit in the warm, sharp sunshine of altitude, appreciate the cool air that blows through the pass; enjoy lunch before descending into the still, oppressive heat of the Fraser. The valley flats below are broad and scrubby, but thankfully we need not descend that far; cut instead across tussock faces beneath unnamed peaks to find the steep, narrow gut ascending to the west of Emily Peak. This is the fifth pass of the day, already a pass too many for legs, knees, tired body. But at least the ground is stable: good scree, a steady ascent shaded by peaks all around. Solid ground on which to pause for countless breathers on the climb. Fraser Valley • By madpom. Licence: cc by. 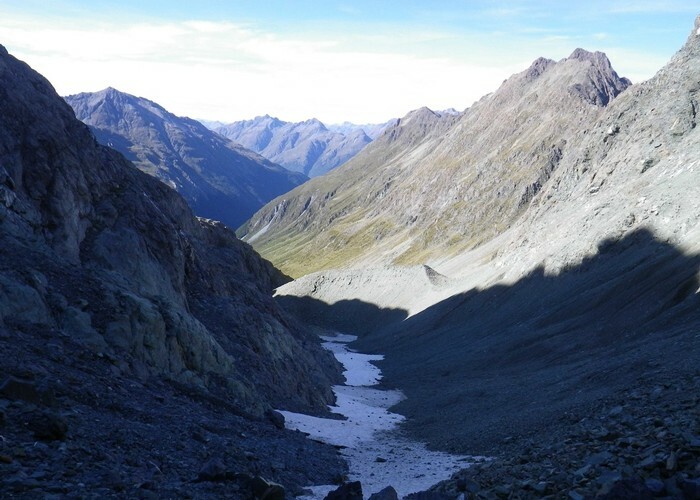 The route guide I checked spoke of a high sidle from Fraser Col to Emily Pass but we find it necessary to descend a good 100m into the basin north of the col before sidling west below steep exposed bluffy faces - climbing again up the creek draining Emily Pass. The contours leading to Emily Pass are close and tight - indicate a steep, tough ascent - reflect accurately the climb to Emily. The route to the pass from the basin climbs steeply up the tight streambed until waterfalls impede progress. A brief scramble up a small bluff on the true left of the creek leads to steep, exposed snowgrass faces above. Ice axe again anchors every step as we ascend: a hundred vertical meters of exposed, slippery snowgrass scramble - all the way to the pass - not a terrace, flat or basin to break any fall. Not a nice route, especially tired at the end of a long day. The same route guide spoke of good camping near the pass - but at the summit we find a boulderfield and a stoat trap. No flat space for a tent. No water. The stoat trappers have, however, worn an easy trail into the Mackenzie Valley below and we follow the line of trap boxes down into the valley. The head basin contains grassy flats littered with huge boulders. Small streams cascade from the faces above only to disappear as they hit the valley floor. Dry rocky channels fading to vague grassy beds as they venture out from the valleyside. Lake Mackenzie • By madpom. Licence: cc by. A small cairn sits prominent atop a flat-topped boulder. We investigate: find a cool shaded rock bivouac in the space behind. It's barely 4 p.m. but after crossing six passes, seven catchments, it's time to rest. The day is still hot, too hot to lie baking in a tent, so instead I crawl into the cool dry space beneath the rock and snooze until dusk. Dusk itself heralded not just by the dimming sky, orange tint on the peaks above, but by the arrival of a cloud of vicious sandflies. I hurriedly pitch the tent crawl inside to safety. 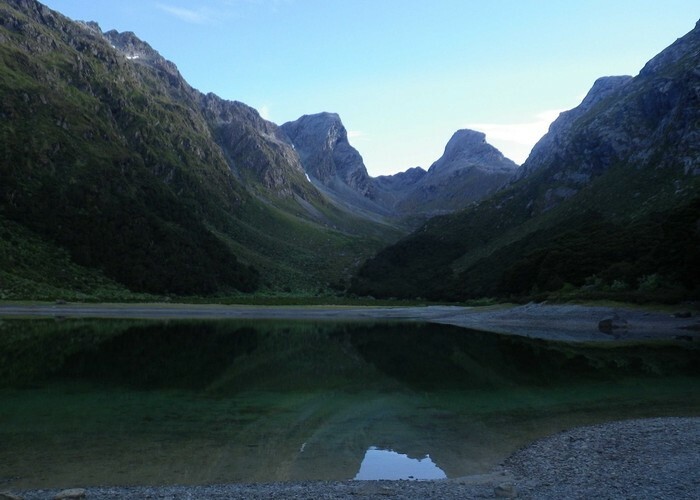 Our final day consists of an easy walk down to Lake McKenzie: visible mirror-like in the valley below; an easy stroll along the well-maintained Routeburn Track to the road at the Milford Summit. Emily Pass • By madpom. Licence: cc by. The flats above Lake MacKenzie are scrubby, but the creek bed is dry so we have a quick, easy walk down to the lakeshore. Following the eastern shore we pick up a signposted track at the back of the bay beyond. A chatter of voices comes from the bush nearby, where we discover the sheltered, sympathetic MacKenzie Campsite. Each site sheltered in the shade of tall beech trees, separated from it's neighbour by vegetation - private and cool. A modest roofed structure in the centre hosts benches, sinks everything you need for a comfortable night of camping. Beyond the campsite the track sidles above the south-eastern lakeshore, sometimes suspended above the water on cantilevered wooden walkways, more often in beech forest. We smell Lake Mackenzie Hut before we see it, sewage system clearly struggling to deal with the demand. I attempt conversation with people on the hut deck, am ignored, continue. Not far beyond lies Lake MacKenzie Lodge: the private guided walkers' hut. Set well back off the track, discouraging nosy non-paying travellers from prying. A vast apex of glass looks down over flats to the lake. Lights blaze inside even at this sunlit hour: glint off the polished wood of dining tables; lounge chairs sitting empty beside the vast window; air conditioning whirring softly. 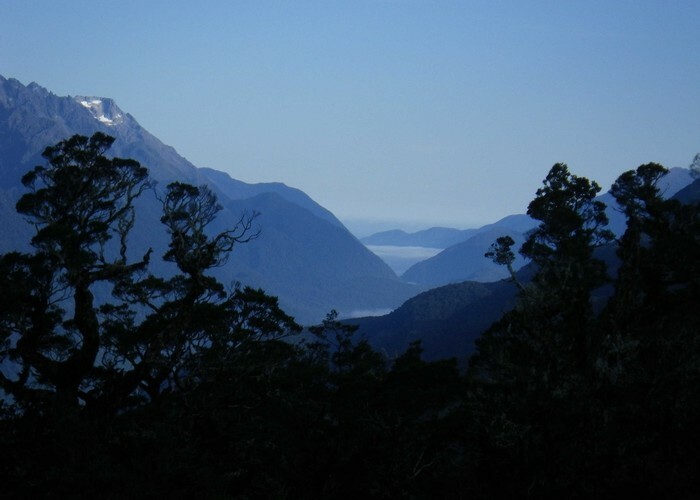 The Routeburn Track climbs gently from Lake MacKenzie Lodge, sidles onto high faces above the Hollyford. 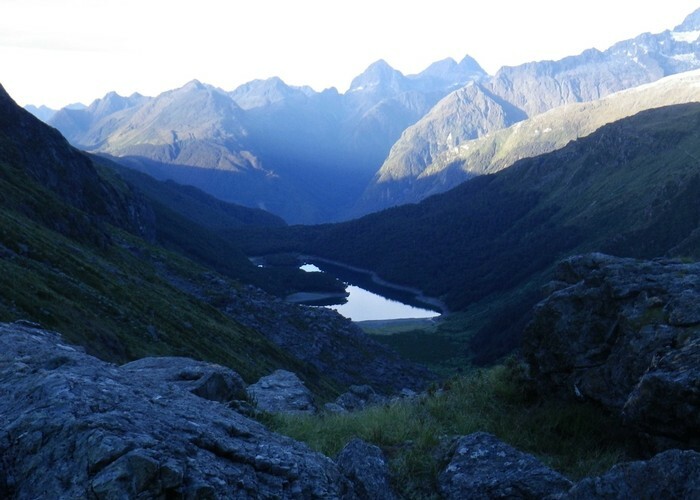 Brief clear shoulders give views down the broad flat valley to the Tasman Ocean beyond. I pass maybe a dozen walking parties, offer greetings, sometimes returned, sometimes not. Two chubby Maori lads grin cheekily - comment on my rushed pace. An older man accompanies them: their grandfather perhaps. Face stern, weathered - tells its own story even without reading the script of its traditional tattoos. Breaks into a warm smile of greeting. Hollyford Valley • By madpom. Licence: cc by. The track climbs high on the face, passes beneath tall waterfalls - ribbons of water cascading down onto the terrace upon which we walk. People pose for photos, selfies - phones held out on purpose-made sticks. We start to meet the day's crowds headed east, pass maybe 50 more walkers before we arrive at Lake Howden Hut. The Maori family have been thus far the only Kiwi voices we have heard. But the group at Lake Howden Hut make up for that. A combined group of perhaps three families: eight tired,complaining children who just want to go home, three tired, swearing adults at wits end. One professional, polite hut warden who probably would like nothing more than for them all to leave. I sit as far from the argument as I can get - on a bench overlooking Lake Howden. The lake's surface is still, mirrored. Beauty. Tranquility. One out of two. The numbers on the track increase beyond Lake Howden, most day walkers sporting just daypacks or with water bottles clutched in hand. A young woman passes in the opposite direction, focussed, running. She has the right idea: the Routeburn with its broad hard surface the gentle climbs, makes an unexciting surface on which to walk, but would be an excellent run. The track zigzags down towards the road, the noise of road-traffic for the first time in two days. Not having known if I would make it over the pass from Double Barrel Creek I have no transport booked from the Milford Road. I make a point of greeting, chatting with each group I overtake as I descend: cheerful self-interest. We emerge into a vast car park filled with cars, campers, busses. On the roadside six people are already lined up under the hot midday sun, thumbs out, hitchhiking. I squat beside the last of them, quiz him on how much progress people have made. It seems just two people have managed it hitch out this morning. I can't say I am surprised, the morning road traffic - people returning from overnight stays in Milford - do not strike me as likely lifts. Much more promising to me are those finishing the Routeburn Track behind us: fellow walkers, hopefully sympathetic to their brethren from the trail. Those very people I have been cheerfully (cynically?) greeting, chatting with for the last half hour. Appologising to the hitchhiker for what I'm about to do ('go for it mate'), I retreat to the end of the trail, sit in shade, chat again to each group finishing their walk. The third to pass is the runner - returning. I comment that I thought she was headed for Glenorchy. She explains that her friend injured themselves the day before and so she has just been out for a shorter there and back run. I ask if she has a spare seat going towards Te Anau. She responds that she is 70% blind and cannot drive. Pauses. Adds that she has a driver, will happily take me when he returns. He soon does, and within 10 minutes we are cruising out of the carpark, past the line of hitchikers and down the Milford Road towards Te Anau. The woman tells me her story - hospitalised with traumatic brain injury by a workplace accident some three years ago, spending two years in hospital - left with just a partial field of good vision in one eye. Years spent in German hospitals with few words of German, convincing a beaurocratic system to allow her to return home for care and rehabilitation in a language that is her own. Succeeding finally. Scaling those virtual mountains that must be crossed on the path towards rehabilitation, relearning, recovery. Retaining that energy, that momentum - going on to scale more physical peaks: challenging herself - proving that she can still compete, still achieve, still appreciate those things precious to her. I smile at the irony. 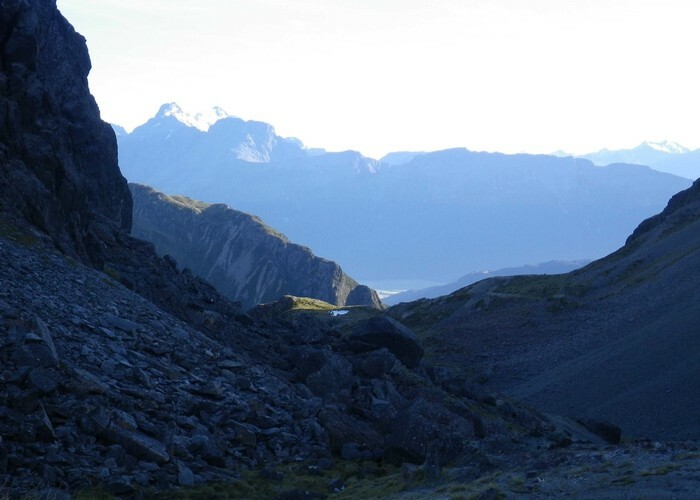 I set out to walk the Not The Routeburn to avoid the people on that more popular trail. But the highlight of the trip has been the people I met, the inspiration they bring. Added 1 February 2018 by madpommadpom. 7 revisions, most recently 4 February 2018 by madpommadpom. 301 views in the past year (25 per month).